Help us bring more public arts to East County. We are Arts on the Block, a non-profit organization that helps creative youth to gain confidence, leadership and workforce development skills through the process of creating public art in their own neighborhoods. For more than a decade, Arts on the Block has been working in East Montgomery County to identify community priorities that can be addressed by art and design projects. This area of the county lacks resources and services for youth and families and also had some issues with crime and safety. In an effort to create a safe, multi-generational arts spaces for community members, AOB and our project partners have hosted several temporary art projects in East County, including movie nights, art workshops, and Summer Fun Camp focused on mural-making. Now we’re ready to take on a bigger challenge - a mosaic mural for the East County Community Center! The theme of the mural will be a ‘strength tree’ and will feature the many ways that our individual strengths contribute to a vibrant community in East County. The image above represents an early creative exercise with middle school youth to learn about personal strengths. Youth will lead the project through every stage of planning and design, all the way through to the finished mural. The total budget for the mural project is $5000. We’ve applied for a small grant of $1000 but need your help to make up the difference. Your donation will go towards the cost of community art workshops, mural supplies and materials, and installation of the final artwork at the community center. With your help, this project will provide a year of creative activities for East County youth and families, a beautiful new mural for the community center, and a great reminder of community pride in East County. This summer, AOB is leading a Summer Fun Camp at the East County Community Center. 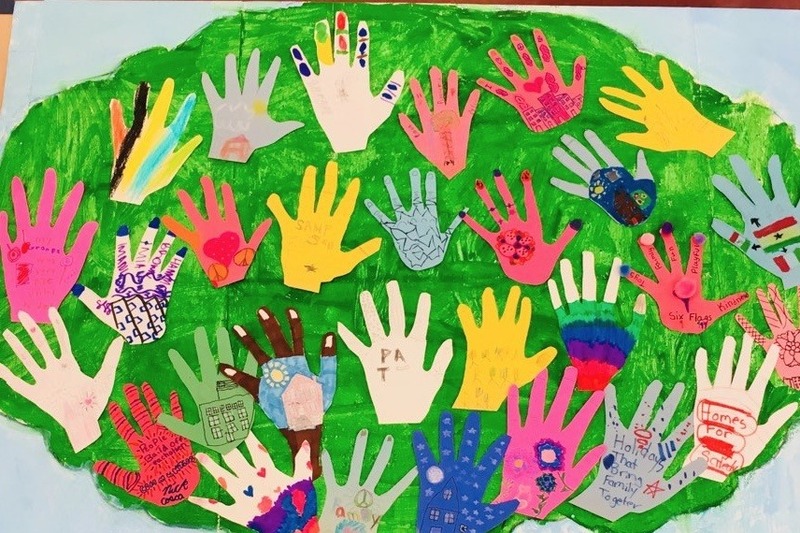 Youth ages 6-12 are discovering some of their own strengths and learning about mural-making by creating an early mock-up of the Strength Tree. In Fall 2018, youth and community members will meet monthly to develop the mural design further. We’ll talk about how to represent everyone who makes up the East County community and how differences make us stronger and more beautiful. The final design for the mural will be chosen in December 2018. In Spring 2019, the mural will finally be ready to fabricate! Creative youth will lead teams of community members to create each section of the mural in mosaic tile, which will be installed in April or May 2019.